Tow with confidence thanks to BOLT Lock, whether it is securing your trailer during a cross country tow, or putting it into winter storage, BOLT Lock has the perfect solution for you! On top of that all BOLT Locks conveniently secure with the key you have with you the most, your vehicle key! BOLT Locks, One-Key Technology, learns YOUR Jeep Wrangler Ignition Key the first time you use them. So you don't need to use another key to unlock any of the BOLT Lock Products, as you can set all your locks to work on with your Jeep Wrangler Ignition Key. Please select the BOLT Trailers and Towing Locks for YOUR Jeep Wrangler and then select which style Ignition Key you have. Please note the Jeep TJ Wrangler and the Jeep JK Wrangler have the same ignition key and the Jeep JL Wrangler has a different style ignition key. 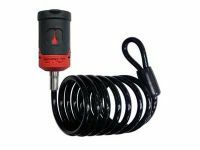 The Jeep Coupler Pin Lock is compatible with the Jeep - Cherokee, Commander, Compass, Grand Cherokee, Patriot and Wrangler.